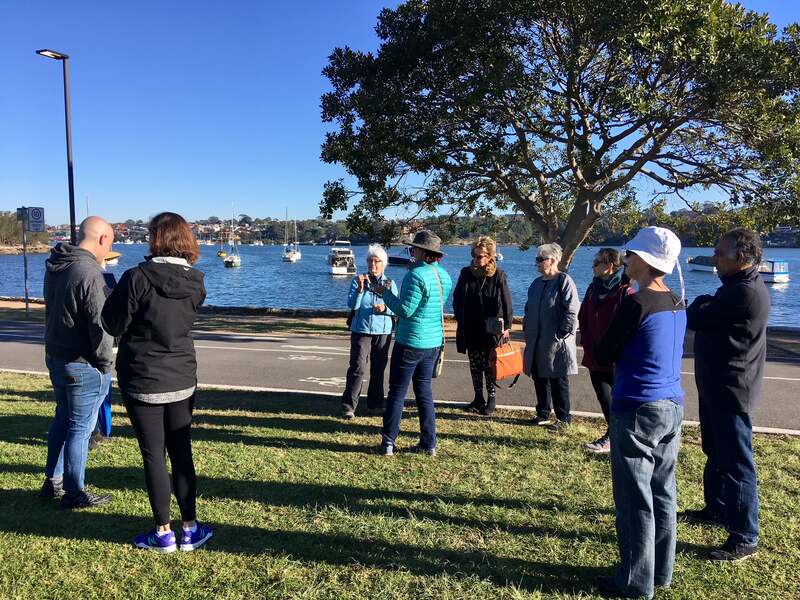 Early on May 20 – a brisk, sunny autumn morning – a small but enthusiastic group gathered for a #CroakeyGO walk in Callan Park, on the shores of Iron Cove in the Sydney suburb of Lilyfield. The walk focused on the shared pleasures of exercise and networking, highlighting the value of public interest journalism (#PIJ), the concerns around mental health policies and funding, and learning more about the history, architecture and environment of Callan Park and the adjacent Broughton Hall. The walk started with an acknowledgement of the traditional owners and custodians of the land on which we were walking, the Wangal people of the Eora Nation. It’s easy to see why the Wangal people of the past loved this land and why their descendants today treasure it. There are some magnificent trees, with lots of birdlife, and mangrove swamps and rock oysters grow along the shores of Iron Cove. 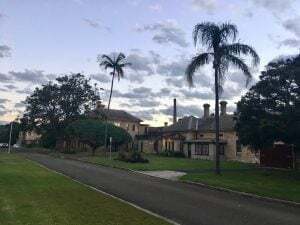 Callan Park and Broughton Hall form a cohesive cultural landscape of exceptional heritage significance (it is listed on the State Heritage Register and protected by specific legislation). The area is greatly valued and used by the community but, as we heard from Rosyln Burge and Sue Steedman from the Friends of Callan Park, its future is continually under a cloud. Callan Park House (originally called Garry Owen Estate) was built around 1837. In 1873 the NSW Government purchased Callan Park estate for a psychiatric asylum, and the first 44 patients (all men) were transferred here in 1876. They watched as the asylum buildings – in beautiful local sandstone in a neo-classical style – were built, designed according to the views of Dr Thomas Kirkbride. Kirkbride was an American, who advocated for hospitals for the mentally ill to be built in a style which he believed promoted recovery and healing. The buildings were completed in 1885 and named the Kirkbride Block. Although, in the early days, there was no treatment for those incarcerated here, and little review of their health status, there were efforts to provide the inmates with pleasant surroundings. In particular, there were extensive plantings, much extolled at the time, and although some plants were later transferred to the Botanic Gardens, there are important remnants today. The area is now identified by the Australian Garden History Society as a Landscape at Risk. During World War 1, Callan Park and Broughton Hall were designated as Army Hospitals for the treatment of “shell-shocked” soldiers. Later Broughton Hall became the first voluntary psychiatric clinic in NSW. Over the years more, rather nondescript, buildings were added to what was eventually called Rozelle Hospital. Most of these more recent buildings are now derelict and boarded up or leased out to community groups. 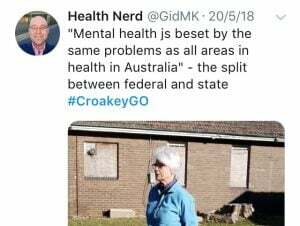 Despite the push to de-institutionalise people in asylums that began in the 1990s following the Burdekin Report, the last mental health patients did not leave this complex until 2008. Our guide Rosyln Burge played us some of the poignant interviews she has done with people who worked in the facility in the later years. Long before 2008, the debate over the future of this valuable site took off. There have been innumerable Master Plans, of variable quality and with varying support. The latest was released in November 2017 and the debate continues. 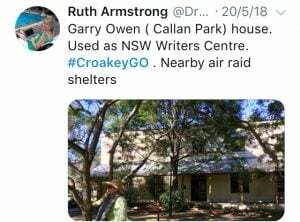 In the meantime, some of the available space is being used by not-for-profit groups (including some providing mental health support), Writing NSW (in the original Garry Owen House) and the Sydney College of the Arts (which is now scheduled to move in 2019). Friends of Callan Park was formed in 1998 in response to then Premier Bob Carr’s plan to sell land for a for-profit aged care facility. We discussed the reasons why the fate of this site has been so controversial – its sad history, the enormous economic value and potential of the land in a crowded city, the value to the community that utilises it for sport and recreation. It was also a chance for us to think about how Callan Park might be better used today to help address mental health needs. We were instantly attracted to the Park as a place of respite and healing. 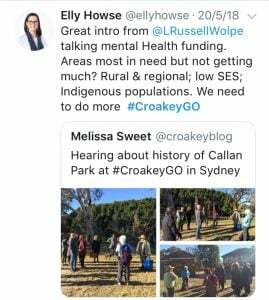 One of the walkers was Elly Howse (@ellyhowse ), a public health PhD student at the University of Sydney who was recently nominated as the Labor candidate for the state seat of Balmain which includes Callan Park. Relief needed from substantial out-of-pocket costs for patients and their families. Despite decades of reports and plans and strategies, there are been limited reforms. Most of the recommendations made by the most recent review from the National Mental Health Council remain unaddressed. 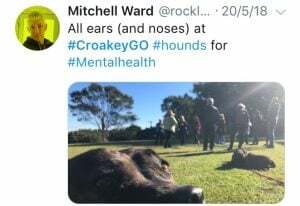 You can access the Croakey library of mental health articles here. The 2018-19 Federal Budget measures aimed at addressing mental health have been described as a “minimal and piecemeal approach to mental health funding and planning”. The budget’s investments in the mental health of older Australians, the provision of support services for those leaving hospital after a suicide attempt, more funding for Lifeline, and more funds to the Royal Flying Doctor Service for mental health outreach in rural and remote areas are welcome, but they do not shift the trajectory of spending on mental health. There continues to be a considerable gap between the resources available (mental health is about 7.6% of the total government health spend) and mental health’s share of the overall burden of disease (13%). Croakey #HealthBudget18 articles and commentary can be accessed here. Lesley Russell’s analysis of the mental health provisions in the Budget (looking at the impact on women but readily translatable to the broader community) is available here (Page 126). 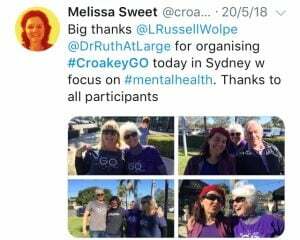 Friends of Callan Park (Margaret Armstrong, Roslyn Burge and I) were delighted to accompany participants on their Croakey Go tour of Callan Park on Sunday May 20, with its focus on mental health. Along with other broad-ranging discussions, Dr Lesley Russell provided illuminating commentary on the recent Federal Budget and its implications for mental health funding as well as a critique of the ‘gaps’ that continue to exist state-wide in mental health services. The walk took place at Callan Park & Broughton Hall, which is listed on the State Heritage Register, and is a heritage conservation area in Lilyfield, NSW, covering 61 hectares of harbour front parklands, stretching from Balmain Road northwards down to the Bay Run, and contains many significant buildings and garden areas. The jewel in the crown is the magnificent sandstone Kirkbride complex, which once housed the first purpose-built and designed asylum in New South Wales. 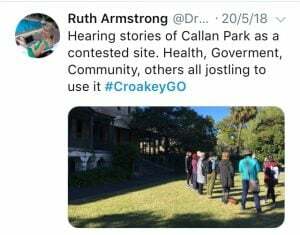 Roslyn was able to provide the Croakey walkers with a commentary and context for the historical use of Callan Park as a place of respite and recovery, whilst acknowledging the impacts of institutionalisation on many of the patients. Today, Callan Park is used by thousands of people every year: as a workplace; for active and passive recreation; for education and training. Concerts, weddings and events are staged here and it is also, importantly used as a tranquil space for quiet reflection. There are more tree species in Callan Park than Central Park in New York: it’s the ‘green lungs’ of the inner west. Friends of Callan Park are celebrating our 20th year in 2018, and have fought a long, community–run campaign to ensure that Callan Park is protected from sell-offs and inappropriate use, and to protect the many heritage aspects of the site – built and landscape – from destruction and/or decay. 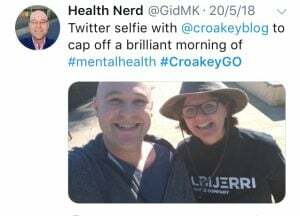 A central plank of our agenda is to advocate for modern mental health services to be established at the site, so we are always interested in broader views and wisdom about this aspect of public health and the CroakeyGo tour participants provided lively commentary and opinion. 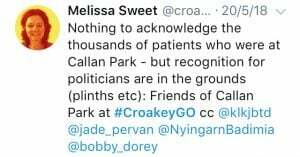 Not-for-Profit Health service delivery is a permitted use of Callan Park as described in the Callan Park (Special Provisions) Act 2002. The expansive grounds and attractive landscape were pivotal in designing the asylum and for their value as a therapeutic environment for psychiatric patients. A modern re-purposing of existing buildings and gardens could provide an ideal location for support services managed by Community Managed Organisations (CMOs) for those at risk of or recovering from mental illness. Friends of Callan Park are in favour of the establishment of day services at Callan Park which provide opportunities for participation in activities and programs designed to promote well-being, facilitate recovery, help prevent isolation and provide a place that is welcoming and socially inclusive: a place where the services are focused on each client’s particular needs. 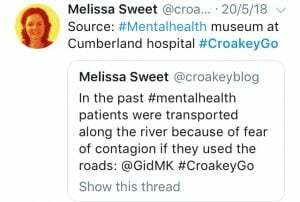 As we discussed on the CroakeyGo tour, these types of community services have long been identified as the ‘missing layer’ in the mental health sector. And it is clear that, properly supported, people suffering episodic mental illness are less likely to require acute care if they receive good support to manage their illness. I know this from personal experience, having managed a homeless support centre in Enmore for many years and assisted hundreds of people with episodic or chronic mental illness. Our mantra was ‘everyone belongs’ and we created a community of care and inclusion for people who had long been marginalised and isolated. This could be readily matched at Callan Park. The use of Callan Park as a place of respite, recovery and care for mental health consumers is overwhelmingly supported by the local community, as evidenced by their responses to many consultation processes about the future of Callan Park over the years. 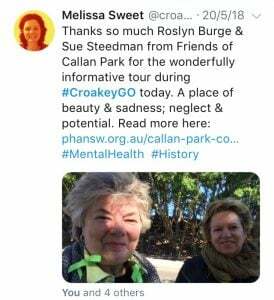 Friends of Callan Park continue to advocate for this use and are grateful to the Croakey team, particularly Lesley Russell and Ruth Armstrong, for their interest in Callan Park, and their passion for ‘keeping the discussion going’ about mental health. We are also heartened that the younger participants on the tour (as well as youthful retirees) were engaged, interested and eager to contribute to the discussion. Professor Stephen Leeder, interviewed over coffee at the end of the walk, talked about how – in the absence of political appetite for major reforms – the important work around integration of care (acute, subacute and community based; physical and mental) must come from the coalface. Health care professionals looking to drive better outcomes for their patients will be willing and astute enough to address the barriers. This is already happening in Western Sydney and elsewhere. Their innovative examples will drive needed reforms from the bottom up. Throughout the walk, Melissa Sweet and Ruth Armstrong did a sterling job with Periscope interviews, and the walkers were definitely a social media savvy mob. This meant we could share our walk with others around Australia – and internationally. You can see the collection of Periscope interviews throughout this article (by late on the evening of the walk they had been viewed some 6000 times) – and don’t miss the great interview with Steve Leeder about public health, poetry and writing. A curated selection of tweets from the day follows. 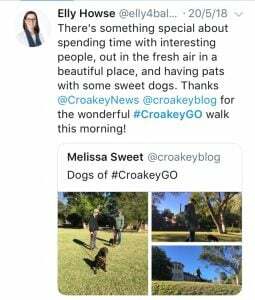 The feedback from this walk has been terrific: we hope that readers will be encouraged to join a #CroakeyGO walk (live or virtually) whenever possible. It’s good for your cardiovascular system and your tweeting thumbs, good for wellbeing, good for learning and networking. Sue Steedman is Chair of the Mental Health Subcommittee Friends of Callan Park. God, the years I spent working on that site for mental health reform at the NSW peak body. The irony never wore off that I was able to walk through the most beautiful landscapes while the inpatients at the Hospital were locked in wards, or at best allowed to stroll outside in a little gated chicken pen, with Bay Run joggers oggling them as they ran by.